This magnificent chandelier is composed of a variety of media, which beautifully contrast in their colour and qualities. This includes lustrous golden gilt bronze (ormolu), cut clear glass, and smooth cobalt blue glass. The chandelier will make a splendid addition to a luxury interior, either traditional or contemporary in its style. The chandelier features an elaborate gilt bronze top canopy, consisting of multiple leafy arms, which scroll in on themselves and terminate in rosettes. Clear cut glass diamonds and drops are suspended from these arms. The canopy surmounts a cobalt blue glass shaped column, with a ball at its centre. At the bottom of the column, there is a gilt bronze dish, from which springs the gilt bronze arms which hold the lights. These arms are arranged on two levels. Each arm on the inner level splits in two, one scrolling to enclose a rosette, and the other developing into a leafy capital, topped by a cobalt blue, spear-shaped glass shade. The outer row springs from the inner level, and is composed of twisting arms, which support wide drip-pans and leafy capitals, with cobalt blue bobeches, surmounted by white candle tubes. Clear glass chains cascade from the gilt bronze top canopy to the lights. More clear glass chains are draped from the arms, along with clear glass pendalgoues, prisms, spears, and a cobalt blue glass ball, which hangs in the space below. Overall very good condition, with some minor restoration. 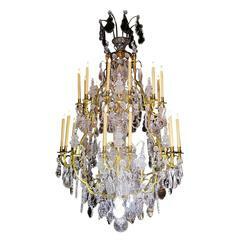 Exceptional French gilt bronze and cut-glass fourteen-light chandelier, the cage with faceted pendants. 125 x 100 cm. 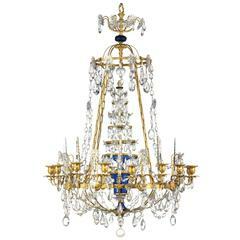 A 19th century neoclassical style crystal and gilt bronze, twelve-light chandelier centred with opal blue glass. 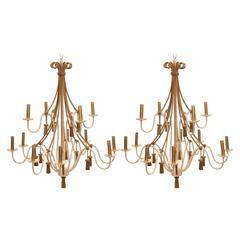 Pair of 12 light neoclassical style chandeliers. With gilt metal rope and gilt metal tassels. Late 20th century. 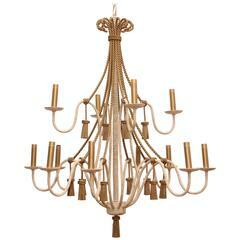 12-light neoclassical style chandeliers. With gilt metal rope and gilt metal tassels. Late 20th century. 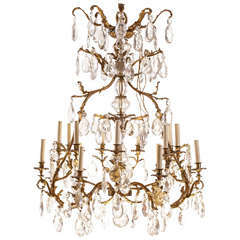 Exceptional French gilt bronze and cut-glass fourteen-light chandelier, the cage with faceted pendants. Measures: 125 x 100 cm.